Was this AP photo 'sanitized' by cartoonist? OK, we've officially gone bonkers. Yes, cartoonists are supposed to provoke strong reactions. 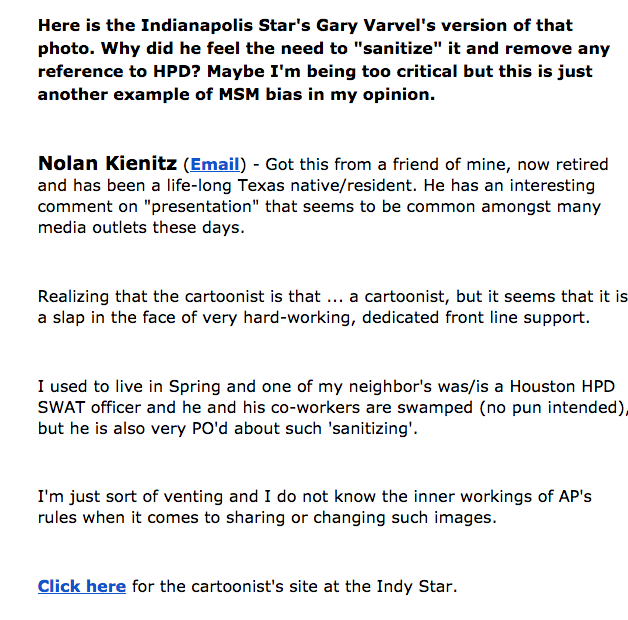 But to accuse Varvel of "sanitizing" the photo with his editorial cartoon? Artists simplify for a reason -- to make a point. Should Varvel have put "SWAT" or "POLICE" on the cap? (That wasn't on the original that I can see, though it's hard to make out what is there.) Perhaps, but then can't it be argued that would marginalize EMS, firefighters, and all the volunteer rescuers who have headed to the area to help? Varvel's interpretation celebrates the idea that all of humanity, no matter or race, our occupation or our political persuasion, pulls together in times of such crisis. He didn't put the person standing in the back in either? Should all the other rescuers be annoyed? He didn't put the submerged car in either - should the automakers be pissed? He didn't put the highway in. Should the road builders be ticked off? We have become paranoid -- looking for a bogeyman and perceived grievances under every (media) rock. 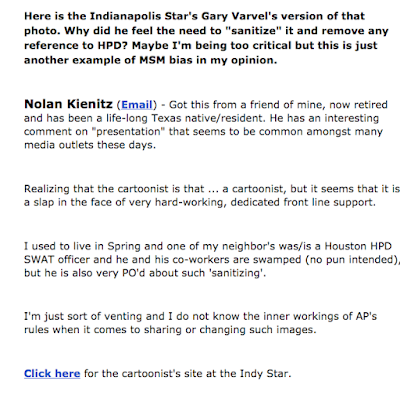 This writer, and others, apparently, who share his views, have tried to take what I consider a noble image, both the original and Varvel's, and turn it into yet another point of divisiveness. Fortunately, I think Varvel's will prevail.